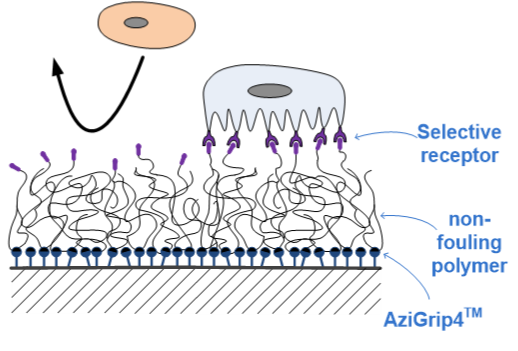 The coatings and applications we offer you with our AziGrip4TM platform are as diverse and versatile as the term ‘bio-functional’. AziGrip4™ BIO coatings are the most robust and adaptable method of achieving functional, fouling-resistant coatings on any substrate. 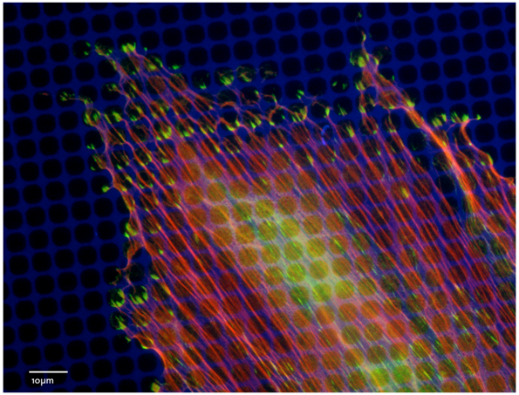 The possibility of introducing bio-active moieties, such as peptides, growth factors or drugs, makes this system ideal for cell-culture devices and for the implants of tomorrow. These coatings can also be used in diagnostics and bio-analysis. The biological components that are to be measured are bound selectively to the sensor, unspecific and unwanted interferences are repelled, and the signal-to-noise ratio is enhanced. In stem-cell research, different functionalizations can be used to control differentiation. On implants, these coatings can both enhance tissue integration and impede bacterial infection. The coatings can be applied all over the substrate or in a very specific micro or nano pattern. Would you like to discuss your particular applications and coating solutions? - Just contact us! We always look forward to new tasks and challenges! Application example for the bio-functional selective binding of cells: combining non-fouling properties with specific binding groups creates a surface that both binds selected cells/proteins and repels unwanted and unspecific contaminants.